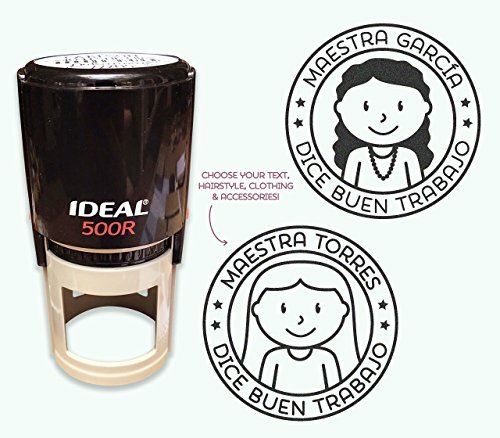 Pink Pueblo's Personalized Self-Inking Spanish Teacher stamp is a thoughtful appreciation or end of the year gift for your teachers, or a great way to motivate students! You get to choose the name, hairstyle and accessories for your teacher to make the stamp as personalized as possible. The stamp is a high quality self-inking photopolymer stamp sized approximately 2x2". Each stamp is a custom creation and may vary slightly in size or text layout. Every stamp is pre-inked with black Ideal/Trodat ink that consistently delivers clear, clear imprints. You'll receive an emailed digital proof of your stamp within 24 hours of purchase. If you have any questions about this product by PinkPueblo, contact us by completing and submitting the form below. If you are looking for a specif part number, please include it with your message.